The chapter discusses the life course and how it explains offending. Examining crime through developmental phases requires studies that are long term, known as longitudinal studies. 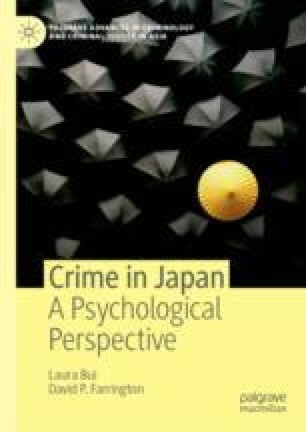 In Japan, however, these studies are difficult to conduct due to government policy. We examine topics of study in the area of Developmental and Life Course Criminology and organise our discussion around a paper published by Farrington and Japanese researchers (2015) using government data. We look at current issues as well: elderly crime is a particular issue that has emerged, possibly because of recent societal changes. Whitten, Tyson, Tara T. McGee, Ross Homel, David P. Farrington, and Maria M. Ttofi. 2018. “Comparing the Criminal Careers and Childhood Risk Factors of Persistent, Chronic, and Persistent-Chronic Offenders.” Australian and New Zealand Journal of Criminology. https://doi.org/10.1177/0004865818781203.